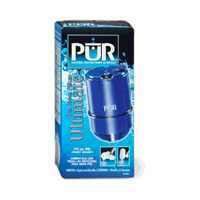 Replacement for PUR Ultimate faucet-mount water filters. Reduces trihalomethanes, chemical chlorine by-products, asbestos, atrazine (herbicide), benzene, chlorine, MTBE, lead, lindane (insecticide), mercury and 2,4-D. Removes 99.99 percent of microbiological cys ts, cryptosporidium and giardia. Leaves beneficial fluoride in the water. Lasts up to 100 gallons with built-in Automatic Safety Monitor Gauge to display life and when to replace.